The Affordable Health Care Act requires a penalty to be paid for those who do not have health insurance. Some people view this as a tax and most who have to pay it do not like it. Some who pay the penalty do so as a form of protest. Let me tell you why it is not cool to pay the penalty. The ACA penalty has no benefits to the person paying. The penalty is a disincentive for those who choose not to get insurance. In effect, the person who insists on paying it will receive nothing in return for his payment. Honestly, it just doesn’t make sense to pay and get nothing. The ACA creates a system whereby the people who cannot afford insurance are subsidized by those who can afford to pay. Think of it as a system where there are ten people eating dinner, and two are unable to pay for their meal. The other eight will pay so that the two can eat. While this may seem unfair consider that someday you might fall on hard times and you will also end up needing a subsidy to get by. The dreaded death spiral is the belief that if more and more people drop out from the insurance rolls, the insurance will get more and more expensive to sustain. The fear is that it will be so expensive to insure people with pre-existing conditions that the system will collapse. Of course, the government doesn’t want this to happen. Unfortunately, the way they want to cope with it is to raise the penalty or take money from other government departments in order to afford the expense. In other words, so as not to pay the penalty, you are getting money from other people anyway. People seem to think that the insurance premiums will take a big chunk out of their income. But the truth is the relative cost of paying the penalty versus getting a bronze plan isn’t that much. Just think of it as sparing you from a Starbucks or some other common expense that you could do better without. 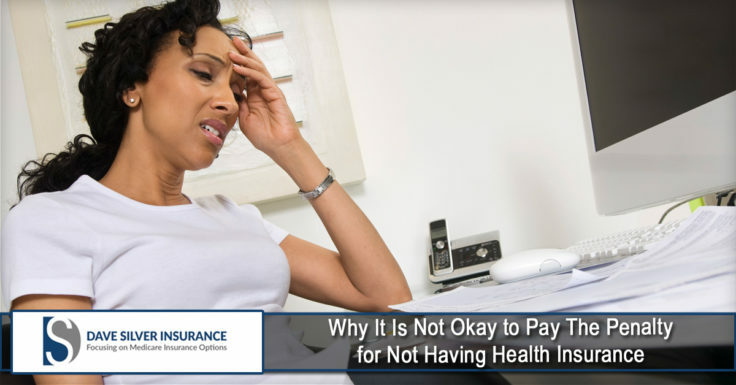 In fact, getting insurance might be the better option considering what can happen if there is an accident or sudden illness that you are not prepared to deal with. At Dave Silver Insurance, we do our best in making sure that our clients are well-protected with affordable and comprehensive policies. To learn more about how we can help you, please contact our agency at (941) 907-2879 or Click Here to request a free quote.